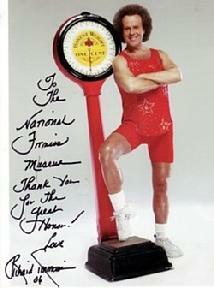 Thirty years and 3,000,000 pounds later, Richard Simmons is still going strong. Using his unique wit, passion and enthusiasm, Simmons, the nation’s most revered fitness expert, continues his crusade to reach out to the masses, encouraging them to take control of their fitness destiny. Delivering a serious message with his trademark humor, Simmons has helped millions of overweight men and women lose more than 3,000,000 pounds by adopting sensible balanced eating programs and exercise regimes that are energetic, fun and motivating. Richard weighed 268 pounds when he graduated high school but took control of his weight by adopting a lifestyle of balance, moderate eating and exercise. Simmons prevailed in his own weight battle before relocating to Los Angeles in 1973. There was no significant fitness movement in this country at the time, and to no avail, Simmons attempted to find a health club that wasn’t for people who were already in shape. After traversing LA, and unable to find a facility welcoming people of all shapes and sizes, his only alternative was to create that safe haven. In 1974, after consulting with doctors and nutritionists to ensure the safety of a program tailored to the needs of everyone, from the overweight and obese, to seniors and the physically challenged, a determined Simmons established an innovative place where the overweight of the world were welcomed with open arms. 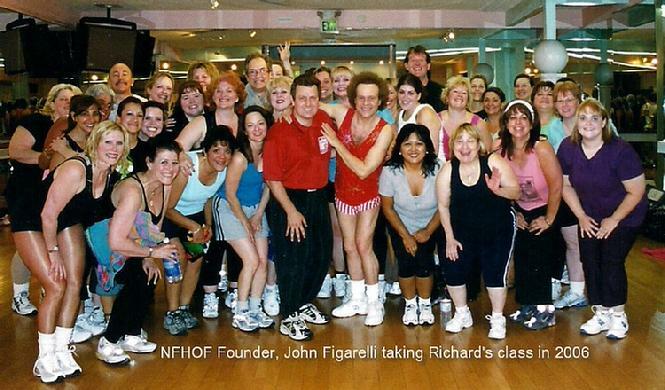 This program was met with instant success and continues today at SLIMMONS in Beverly Hills, where Richard still teaches. While many of his legions of fans are overweight, he resonates with everyone, including anyone who has just a few pounds to lose and wants to be fit. Still fighting the fitness battle with humor and enthusiasm, Simmons vows to never give up and promises that he will continue his crusade until it’s time for him to teach classes at the Pearly Gates.